Recency - how recently the elements have been introduced into the learning process. 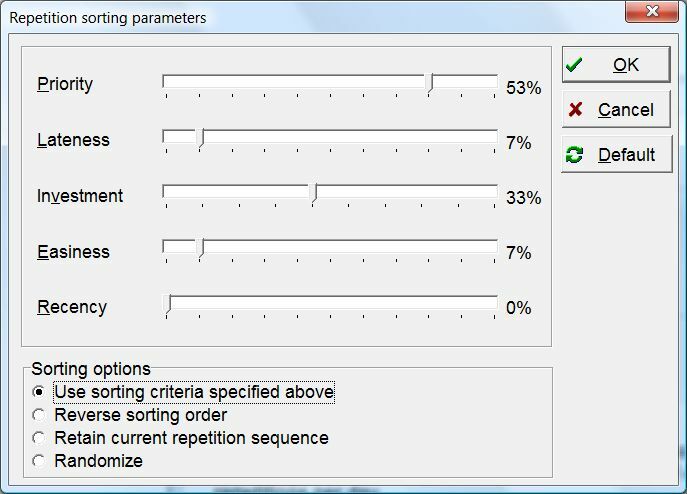 The recency is determined by (1) intervals (shorter intervals indicate recency), (2) memory lapses (lapses refute recency) and (3) number of repetitions (recent items have fewer repetitions made). Use this criterion when the most recently introduced material is of highest recall priority (e.g. in cases you memorized some critical job-related material before leaving for vacation). This criterion is also very useful if you are going through a crisis with your repetition (Do I really need to spend that much time with SuperMemo?). Recency criterion will help you quickly realize what great stuff you have learned recently and what a pity it would be to lose it to forgetting. If the break is long enough, you will also see what a painful proportion of elements you have already lost! Warning! By abusing Recency and Easiness criteria you can indefinitely reschedule some harder long-interval elements! You might be very disappointed in a year or two to discover that some elements have gained very long-intervals without a single repetition and have entirely faded from your memory!